The wisdom of Confucius, Chinas greatest teacher and sage, can guide each of us in our own time.Twenty-six centuries after their origination, the principles laid down in the Analects of Confucius still act as the foundation of Chinese philosophy, ethics, society and government, and play a formative role in the development of many Eastern philosophies. In this intriguing look at the ethical and spiritual meaning of the Analects, Rodney L. Taylor, the foremost American researcher of Confucius as a religious and spiritual figure, explains their profound and universal wisdom for our own time. 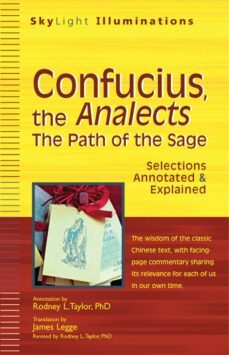 He shows how Confucius advocates learning and self-cultivation to follow the "path of the sage" or “Way of Heaven”—a journey that promises to promote reason, peace and understanding.Alongside an updated version of the classic translation by Sinologist James Legge, Taylor provides informative and accessible commentary that illuminates the meaning behind selected passages from the Analects and their insights on character development, respect and reverence, and the nature of learning, goodness, truthfulness and righteousness.